From features such as an 18-hole golf course to activities including horseback riding and a number of sports, the luxury camping site of Domaine des Ormes is a wonderful destination. 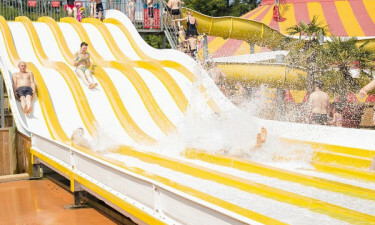 The camping site also boasts five different pools with six water slides. The Domaine des Ormes is able to provide a one-of-a-kind camping holiday that can be perfect for the entire family. Why is Domaine des Ormes a Great Choice for the Entire Family? No less than 400 acres of woodlands. Only 25 kilometres from a pristine beach. 700 pitches to choose from. One of the aspects which has allowed Domaine des Ormes to be so popular with families is that the different types of accommodation are all equipped with very modern amenities. Not only are electricity and gas provided to visitors, but charcoal barbecues are supplied at no extra charge. Some other benefits include air conditioning, Internet access and even flat-screen televisions. Château des Ormes boasts five different pools for guests to enjoy. Six water slides are popular with children and as covered pools are available, the water can be enjoyed during any time of the year. Adults who wish to relax after a dip can visit on-site Jacuzzis and spas to obtain a bit of rest and relaxation before exploring what else this luxury camping destination has to offer. This holiday camping site is much more than pools and accommodations alone. There are countless other activities for the entire family to participate in. These include tennis, football, volleyball and basketball. Other unique pastimes such as archery and fishing are likewise available. There is a large on-site playground to keep the young ones occupied while an adventure course is an unforgettable way to enjoy any stay here. There are two restaurants found within this luxury camping site. These are à vin Le Cellier and L'Oie Gourmande. 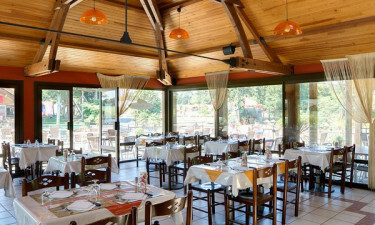 Both serve up delectable dishes that reflect the tastes of French Brittany while international cuisine is available for those who desire a taste of home. Anyone who wishes to enjoy an aperitif or a cocktail can frequent Bar du Moulin or The Clubhouse Bar. Snacks, salads and pasta dishes are also available throughout the day. Finally, there is a pizzeria with an open-air terrace in addition to the two restaurants. The ability to purchase local produce and other items adds to the sense of camping luxury to be experienced here. A supermarket is open from April until September while a gift shop can be visited from May until late August. Fresh produce, bread, stationery and other keepsakes can be found at these locations. All major credit cards are accepted.